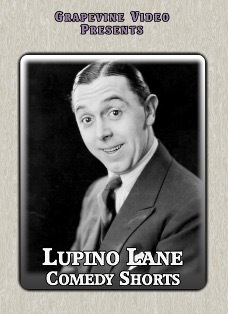 If you’ve been stopping by this site for a while, you’ll have probably noticed that Lupino Lane is one of my favourite silent clowns. He may not have reached the character based heights of Chaplin, Keaton or Laurel & Hardy, for instance, but he was a very special talent indeed. Nobody could do out-and-out slapstick like him.Steeped in his family’s tradition of pantomime, music hall and acrobatics, he was almost without equal at creating dazzling, lightning-paced routines out of almost nothing at all. If you’re a fellow fan, there’s some great news of two DVDs featuring his work. If you’ve not discovered him yet, both are a great place to start discovering his often jaw-dropping physical comedy. These are from his heyday in Hollywood, working for the (inappropriately named) Educational Pictures. MAID IN MOROCCO (1925) was his first short for the company. Directed by Charles Lamont, it features Lane honeymooning in Morocco. His blissful time is spoiled when the local Caliph (his brother Wallace Lupino, omnipresent in these films) decides to steal Lane’s new bride for his harem. Lane’s attempts to rescue her produce some great, gag-packed chase sequences, including his amazing stunt of running 360 degrees around the inside of a Moorish arch! MOVIE LAND (1926) is a great little comedy, with some wonderful routines as Lane makes a date with actress, Kathryn McGuire, accidentally stands her up, then tries to crash the studio to apologise. Best of all is his routine disguised as a stunt dummy. Complete prints of this film contain a Lloyd Hamilton cameo, but it most often circulates as a cut-down edition. Time will tell how complete this print is. Kathyrn McGuire is again the love interest in NAUGHTY BOY (1927). A notch below the other two films for gag-packed excitement, this is still a very entertaining two-reeler. It’s closer to a Hal Roach situation comedy in its plot than usual, as Lane is forced to pose as a young boy when is father remarries and lies about his age. The last two films on this disk showcase Lane’s fondness for dropping his bewildered, mild little character into dramatic or epic settings to provide comic contrast. FANDANGO (1928) has him as an unlikely bullfighter, caught up with serenading sultry Anita Garvin and his rival toreador Wallace Lupino. Directed by Lane under the pseudonym Henry W George, this is one of his best-made comedies, with some wonderful camerawork. BATTLING SISTERS (1929) is a bizarre, futuristic gender-bending semi-spoof of ‘THE BIG PARADE’, with men and women’s roles reversed. One of the rarest films here, it’s also by far the strangest, offering the spectacle of Wallace Lupino, in drag, vamping the helpless house husband Lane! Lane didn’t abandon his silent comedy technique totally when sound came in. After returning to his native Britain in 1930, he starred in and directed the comedy feature ‘NO LADY’. Essentially an extended reworking of his silent short ‘SUMMER SAPS’, it’s a bit creaky, but once it gets going it features a host of his classic silent comedy routines (including that ‘running round the arch’ gag) amidst some fantastic vintage location shooting in the seaside resort of Blackpool. The final chase, melding silent comedy to strategically place sound elements, seems to me exactly what Buster Keaton wanted to be doing at this point. ← SILENT LAUGHTER WEEKEND: programme revealed!